When you visit a preschool it is essential to ask how much art the children are creating each day. At the core of learning is the desire to be creative, and children know the difference between true art and art that is directed by adult expectations. A good preschool needs to provide art through out the day, not just on certain occasions. The best art is process art, where children are allowed to create their own vision, with the only result is that they like what they have created. 1. Art nourishes a child’s soul and true creative spirit. 2. Creating art promotes self esteem. 3. Art encourages children to give attention to the physical space that surrounds them. 4. When creating art children learn to solve problems and think for themselves, known as critical thinking. 5. Art teaches children to use their senses. 6. Children can share and reflect on their art work to help them makes sense of the world they live in. 7. When art is integrated with other curriculum, children commit to the learning process. 8. Art stimulates the right and left side of the brain. 9. Art teaches there is more than one way to solve a problem. 10. If a child learns to love art, this will stay with them forever. If we want children to love art, it needs to be a part of their daily preschool life. This will far outlast knowing their ABC”S or how to write the alphabet. Debbie Bacino has been an early childhood educator for the past twenty years as a preschool teacher, director and parent educator. She is a member of the National Association of Early Childhood Educators, Pasadena City College’s Advisory Board and a local preschool directors networking group. Debbie is the owner and Director of La Canada Preschool. Her vision is to provide the best environment for children to experience discovery and their sense of wonder at this magical moment in human development. 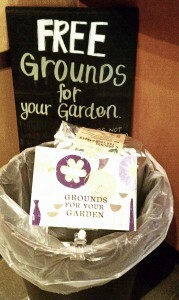 I recently walked into the Starbucks in Frog Alley and saw the sign for Free Grounds for your Garden and what did I see? 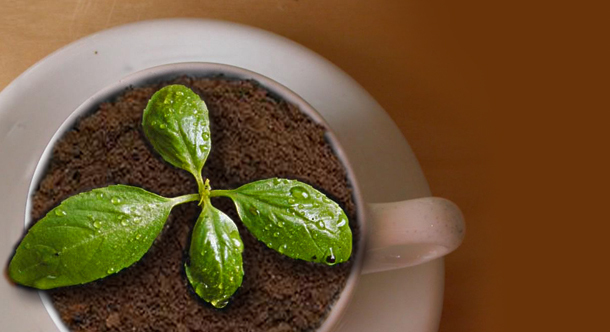 Free Grounds for your Garden! Now that’s an offer any good composer can’t resist! What I didn’t know is that Starbucks has this environmental program that tries to make each store more green! Grounds for Your Garden, introduced in 1995, provides interested customers with complimentary five-pound (2.27-kilogram) bags of soil-enriching coffee grounds. Where commercial composting is available, many stores are able to divert any remaining coffee grounds and food waste from the landfill as well. 1. Don’t compost meat, bones, poop, things with chemicals, etc. The meat, bones etc will attract rodents and other yucky things. 2. Do compost grass clippings, leaves, egg shells, coffee grounds, veggie peels, etc. 3. Worms are good! Welcome the worms to your compost! 4. Compost won’t stink if you give it air. When it’s outside turn it out wit a shovel, poke holes with a stick. Just let it breathe! 5. 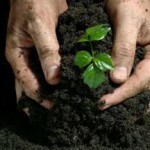 Compost is good for your soil. Mix it with your existing dirt and it will help kill the weeds and make the crops grow higher. Steve O’Bryan is a resident of Glendale who loves where he lives. He runs Smack Smog Inc a Strategic Content company that helps Organizations reach their goals via the Internet and Social Media. He has a crazy love of composting that he developed when he lived in the crazy province of Manitoba. Little Free Library in Glendale! Have you ever heard of the Little Free Library? One of our Urban Toot Staffers and his family have decided to take on this very cool project of creating their own mini public library. The exact location hasn’t been determined yet (we’ll let you know when it is). How little you ask. Very little. Here is a picture of a common library. To build a sense of community as we share skills, creativity and wisdom across generations. To build more than 2,510 libraries around the world–more than Andrew Carnegie! Sounds pretty cool! What is so appealing to us is that it promotes literacy and community. It makes a statement of “We trust you. 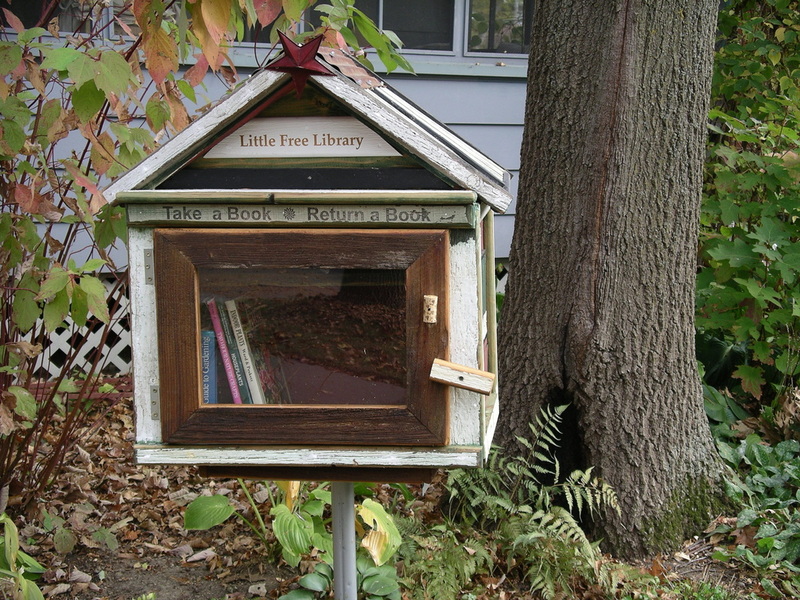 we know that you could steal all the books, you could damage our little library but we trust that you won’t.” In other words it builds community. In today’s world of me, me, me it’s tough to find a worthy project that’s worth supporting. In fact sometimes it’s tough just to find a project not to be cynical about. Today Urban Toot wants to challenge you to be more then just yourself and to get behind a project in which many, many things can go wrong but the Staff at Urban Toot wants to believe that it will go right! We’ll keep you up to date with what’s going on with the Free Library Project. In the mean time what community projects do you support? Let us know in the comments, we’d love to hear from you! I was recently at my vet’s office, Parkview Pet Clinic in Glendale, and saw a flyer printed by the ASPCA which read, “101 things you didn’t know could harm your pet”. I consider myself to be pretty cautious and careful with my two Labs but I was interested to see if I knew of the 101 things. I learned a lot and wanted to share with you. The first thing that I learned was: “of the 167,000 poisoning cases handled by the Animal Poison Control Center in 2012, the no. 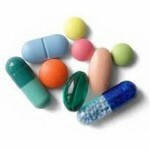 1 culprit was human medications” (ASPCA). This seems crazy to me since all of our medications are in the cabinet above our sink in our bathroom. I have yet to see either of my Labs crawl onto the sink counter and open the cabinet but I also understand that people might leave their medications laying around the house where pets can get to them. The ASPCA explains that symptoms of poisoning vary but your pet may experience vomiting, diarrhea or lethargy. If you experience this with your pet you can call 24/7 to the Animal Poison Control Center at 1-888-426-4435. 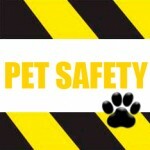 Be prepared with your pet’s breed, age and potential poison. Now is the moment of confession…..yes we have had to call this number. When our Lab puppy was a few months old, she got into some grapes. One of the kids left a bowl on a coffee table and the puppy grabbed a bunch and ran off to eat them without anyone noticing. (Just for the record I was not home at the time!). When I returned home and found an empty vine of grapes I panicked. 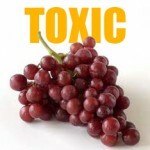 I knew that grapes are toxic to dogs! We called the poison control center and they walked us through a process of helping our dog. They charged us $75 to our credit card but I will share the secret with you for free. If you discover that your dog has just eaten something toxic you can induce vomiting right away with the attempt to get it out of their system right away. Give your dog a soft piece of bread and then 1-2 tablespoons of hydrogen peroxide. You can stir the peroxide into some peanut butter or yogurt, something that your dog will enjoy eating quickly. Then head outside and wait for your poor puppy to vomit. She will pace around and feel terrible, not fun to watch. Then she will throw up the toxic food that she shouldn’t have and will feel much better. It was super fun for us to count the grapes in a puddle of puck! We had round two with another dog that got into some chocolate. Having shared this with you, if you have an emergency you can also head to the emergency clinic or vet’s office for professional intervention. Poisoning is nothing to mess around with. Sometimes stomach pumping or surgery is needed in these situations. Now that I have totally scared you and gotten your attention, here are the lists of items to look out for…..
Household Items: ibuprofen and aspirin, acetaminophen, cold and flu meds., antidepressants, vitamins, diet pills, anti-cancer drugs, tobacco products, detergents, fabric softener, drain cleaners, oven cleaner sprays, disinfectants, bleach, lime/scale remover, paint thinners, lighter fluid, insecticides, flea and tick products, rodent bait, mothballs, fly bait, lead and liquid potpourri. 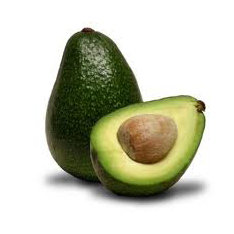 Harmful Foods: chocolate, gum and candy, grapes, raisins, macadamia nuts, avocados, onions, garlic, salt, tea leaves, coffee, alcoholic beverages, raw yeast dough, spoiled foods and fatty foods. Objects: balls, sharp objects, coins, buttons, batteries, twist ties, rubber bands, cotton swabs, glass, hair pins, jewelry, nylons, paper clips, plastic wrap, yarn or needles & thread, dental floss, electric cords, wax, socks, and towels. Common Plants: aloe, amaryllis, Andromeda japonica, Asian lily, asparagus fern, Australian nut, autumn crocus, azalea, belladonna, bird of paradise, bittersweet, black locust, branching ivy, buckeye, Buddhist pine, caladium, calla lily, castor bean, ceriman, clematis, cordatum, corn plant, cycads, cyclamen, daffodil, daylily, devil’s ivy, dieffenbachia, dumb cane, Easter lily, elephant ear, emerald fern, English ivy, eucalyptus, ferns, fiddle-leaf-philodendron, Florida beauty, foxglove, glacier ivy, gladiolas, gold dust dracaena, golden pothos, heavenly bamboo, honeysuckle, hurricane plant, hyacinth, hydrangea, iris, Jerusalem Cherry, jimson weed, kalanchoe, lantana, lilies, lily of the valley, lupine, marble queen, morning glory, mother-in-law, mountain laurel, narcissus, needlepoint ivy, nepthysis, nightshade, oleander, panda, peace lily, philodendron, poison hemlock, precatory bean, privet, red emerald, rhododendron, ribbon plant, sago palm, stain pothos, schefflera, striped dracaena, sweetheart ivy, tulip, water hemlock, wisteria, yew and yucca. Trouble Areas: doors and windows, balconies, bathtubs and since, toilets, washer and dryer and fireplaces. Dogs are more likely to be injured in these areas of your home. Keep your pets away from these places or watch them closely when they’re near them if you can. Outside the home: algae, antifreeze/coolant, fire pit/grill, fences or gates, deck lattice, non-pet safe de-icing salts, compost, gasoline, oil, pesticides, fertilizer, pools and hot tubs. Make sure that your dogs are safe if they enjoy the outdoors by keeping them leashed and away from these potential dangers. I know this is a lot of information. I felt that it was important to write because I have heard of too many stories of pets lost due to poisoning. My sister-in-law lost her beloved dog due to raisin poisoning. He got into a container of trail mix and ate a large amount of raisins. When dogs eat raisins it causes them to go into renal failure. So very sad. We have also had our brushes with potential life threatening poisonings but thankfully have not lost a pet. Let’s all keep our furry ones close and safe! Mother of two humans and two canines. Author and therapist in “pre-mom life”. Many of you have noticied that a local hangout has been closed for a few days which has created much speculation and concern. Urban Toot decided to get to the bottom of this mystery and contacted the owners to find out what’s going on. Here’s what they had to say! We are almost done installing our brick oven for Pizza / Flat Breads. We are converting our Pastry case to a full buffet. We are planning to serve Lunch and Dinner all you can eat Buffet Daily for only $6.95 for adults and $3.95 for kids which also includes all you can eat Flat Bread. In addition, Sat and Sunday we’ll be serving Breakfast Buffet for only $5.95 for adults and kids under age 5 are Free. We are also extending our Catering Menu. We are still going to offer our baked goods and coffee/Tea daily as before. We will still have morning pastries (Danishes and Croissants) and Artisan Bread. We are hoping to open end of next week (God willing!) Will update you with exact date however we will be serving our Breakfast Buffet this weekend in the Cake Studio side as before. Once again Urban Toot has the real facts about Glendale!